The Freedom 3 Land Rover has been transformed almost beyond recognition under the bonnet, but the exterior remains unaltered and distinctly Land Rover. The magic lies in the 80kW permanent magnet motor that is coupled directly to the original transfer case, which delivers 600N.m at low speeds thus effectively eliminating the need for a gearbox. The makers have retained the High/Low and Diff Lock functions in the transfer case so it is still a very rugged off-roader. Freedom3 is the first of several electric conversions that Chobe has set out to accomplish with Freedom Won. It is capable of creeping along sandy rutted tracks and climbing rocky ascents, then setting out on the open road at speeds up to 120km/h… Chobe Game Lodge intends to use Freedom3 for two/three game drives per day, the traditional early morning and late afternoon drives around the park and along the river. Freedom3 will also be used daily to commute guests to and from the Kasane International Airport, which is a 30km round trip. Each game drive amounts to a similar distance. Given that most of Freedom3’s driving will be on sand tracks a typical range is estimated at 120km. On the open road she will manage 150km if driven carefully. In Freedom3’s off time she will be receiving a charge in the lodge’s dedicated Electric Vehicle (EV) charging bay, which takes prime location in front of the lodge. A simple 30 ampere (A) 230V single phase source is all that is required to power up the 5kW charging system, with all control managed on board by the advanced Battery Management System (BMS). An average charge will be two to three hours, although if Freedom3’s cells have been fully depleted she will need 6 hours to ‘fill her tanks’. The electricity consumed at CGL originates from the Victoria Falls hydroelectric power scheme and is thus environmentally friendly. 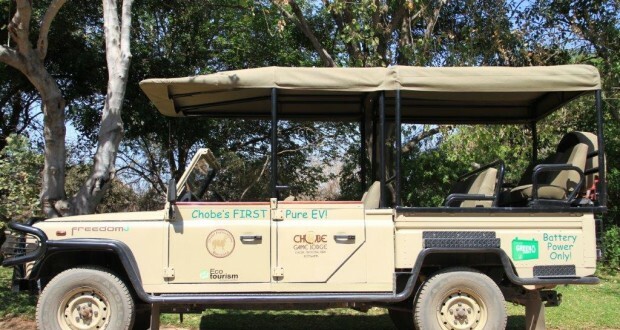 Solar panels are however a natural “Phase II” proposition for Chobe Game Lodge (CGL) and any other lodge not fortunate to have access to clean energy. Clean and quiet transport is not the only draw card for CGL. They will achieve substantial savings in diesel consumption.